Metro Vancouver’s second blast of snowfall has started and much of the Lower Mainland remains under a snowfall warning today. 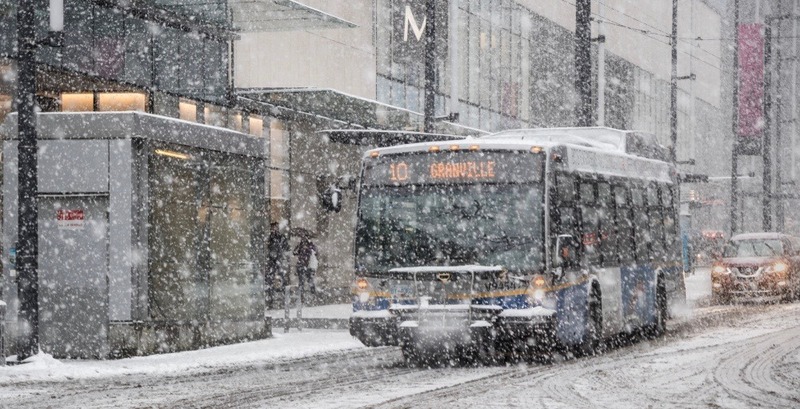 As transit riders prepare for their morning commute, TransLink has announced a series of service disruptions, detours, and delays due to the poor weather. The major snowstorm that hit the region over the weekend has created some rough areas that are expected to impact all types of traffic, including transit, this morning. Many 60-foot articulated buses have been replaced with 40-foot buses, due to their ability to better navigate snow. This, however, means that some bus routes will see increased crowding. Slippery conditions have also been reported across the region, so be sure to exercise caution. #RiderAlert 143 SFU/Burquitlam Station and 145 SFU Production Way Station are experiencing delays as we change from 60 ft uses to 40 ft buses due to road conditions. Handydart is only operating its essential services for renal and cancer patients. Vehicles will have two staff to assist customers and shovel the vehicle if it becomes stuck. SkyTrain attendants have been deployed at station platforms to staff all trains. The company explains that while they won’t be able to run trains at full capacity, there will be more trains running than yesterday morning. Passengers, however, should prepare for longer wait times and heavier crowding around trains and platforms. Travelling outside of peak hours is also recommended. Update: TransLink has reported that as of 10:45 am, Expo and Millennium Line trains are running at a slightly higher-than-normal capacity. Service is operating normally, although be prepared for increased rider volume. Services are operating normally, although remember that platforms can be slippery.